Thanks for votes & opinions! I agree that we should go for 8x connector and now it’s done. In the other news, drive PWM modulation depth was adjusted to match hardware capabilities. It’s bumped from 88% (same as VSD-E and Argon) to a new record level of 97%. Modulation depth means the maximum duty cycle swing that power stage can produce. This means another 10% increase to effective output voltage vs drive supply voltage. With the “PWM magic trick” the total change now is +27.8%. So the 55 V supply now equivalent to 70 V in the original firmware scale. I wish happy new year 2015 to all our fellow followers! 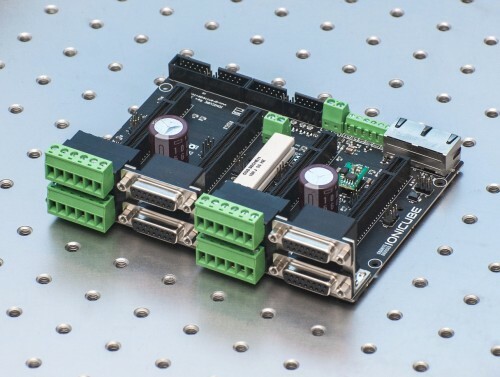 New poll: should we switch to PCI-e 8x connector on IONI? I made a new poll to ask whether we should change IONI’s PCI-e 4x connector to PCI-e 8x type to favor higher currents. Please vote and/or leave comments! We have started development of Mach4 motion control plugin that supports SimpleMotion V2 bus. This means that ARGON and IONI drives can be controlled by Mach4 without any extra hardware. It just needs the SMV2 USB adapter and drives. 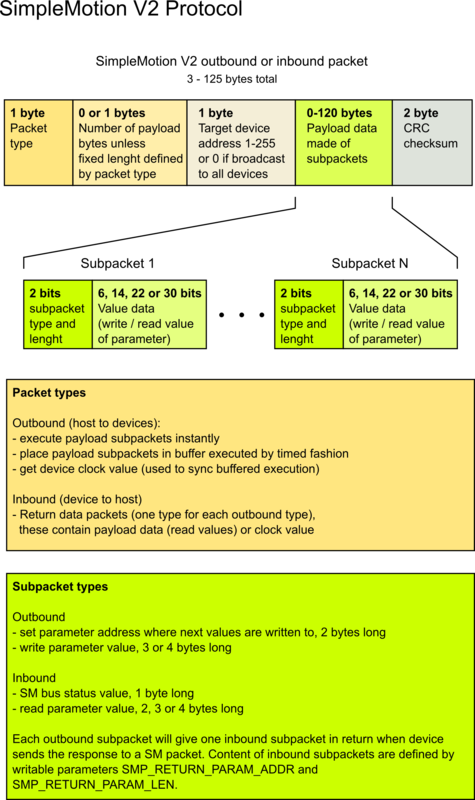 The plan is also to allow control of few I/O signals through that plugin. The plugin will be fully open source and available on GitHub if Artsoft sample plugin code license allows that (will be determined later). Latest innovation made to IONI firmware allows generating 15% higher output voltage for 3 phase AC motors which in practice means 15% greater maximum possible speed of motor. This is achieved by by altering the duty cycle generation of power stage so that it’s being utilized better for this kind of waveforms. 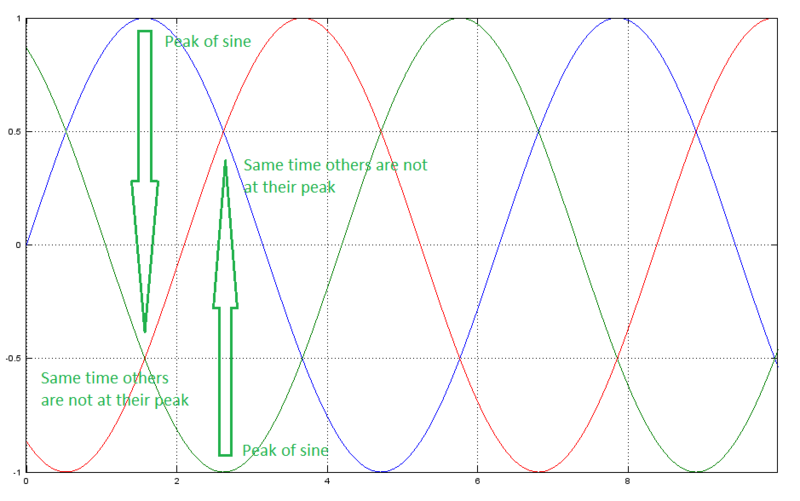 By looking the typical 3-phase motor voltage waveforms below, one can notice the peaks of sine waves occur one-at-a-time which means there is some headroom in the opposing polarity waves. 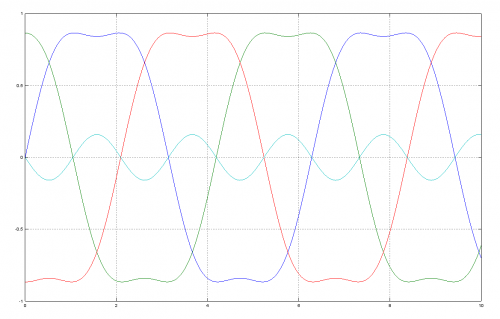 We can utilize these empty gaps by shifting all three waves up and down so that empty gaps become filled. 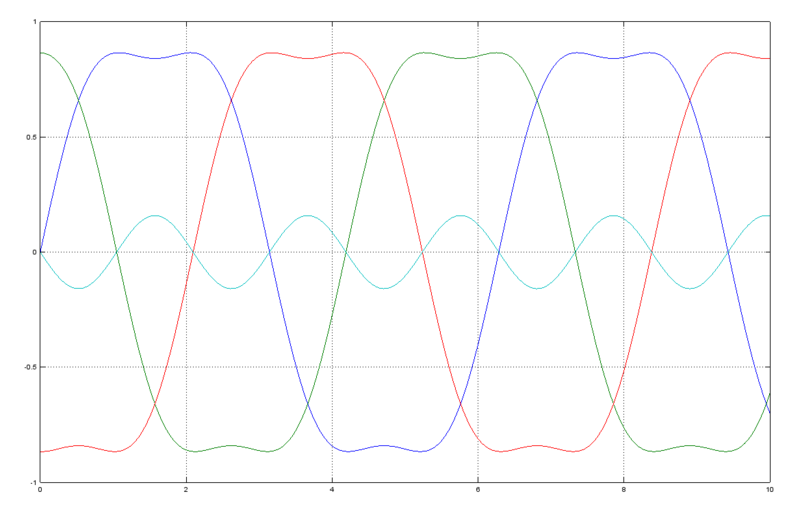 Same signals with summed third harmonic (cyan) to all phase values. This reduces peak amplitude of all signals by 15% without affecting to any phase-to-phase waveform shape or amplitude. In other words, motor sees no difference between this and the original. After this step, we can multiply them by 1.15 without exceeding the maximum range of +/-1. This method has been tested and it works flawlessly. Same smoothness but just a bit higher speed range is available from the drive. The trick effectively does same as increasing drive supply voltage from 55 V to 64 V without actually increasing it. This, and as many as possible, new features of IONI will be ported back to ARGON as soon as the IONI is out. We have been experimenting with adaptive current limit on IONI prototypes. This means there isn’t fixed specifications saying how much current drive outputs continuously and peak but there is just one specification: maximum. Drive will allow maximum output if it runs cool enough and will start throttling down current if temperature rises beyond certain level. This means, if you cool it well, you will get lots of power. So far it seems to be working very nicely! See the video below. As we were now able to push prototypes to their limits without worrying to break the only units, it turned out that we have been underestimating them! Without cooling it seems to output approx 9-10 Amps and with cooling 15 Amps (actually it could go higher but the lab power supply ran out of juice). What do you think about this? No words needed, but I write anyways! Today is the day when first production candidate IONI drives arrived. Few minutes after arrival, the first motor was spinning with great success. So far everything is looking very good. Someone please come and tie me to the chair so I can stop floating around! It’s now called IONICUBE and it’s here! 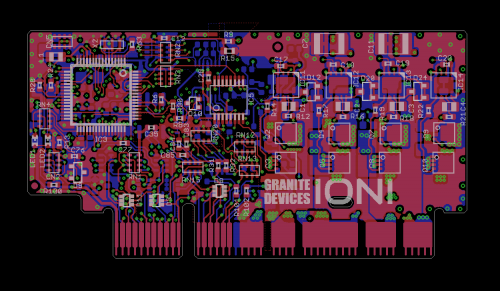 As title says, the former IONISPHERE motherboard for IONI drives is now renamed as IONICUBE which describes the shape better :) Thanks you João for sharing the idea in comments, you will get one set for free once ready! During the past year we have shipped VSD-E drives with same higher current limits than the former VSD-XE model as we were confident that it would not cause any reliability issues. And it has not, as expected, no issues have been reported! 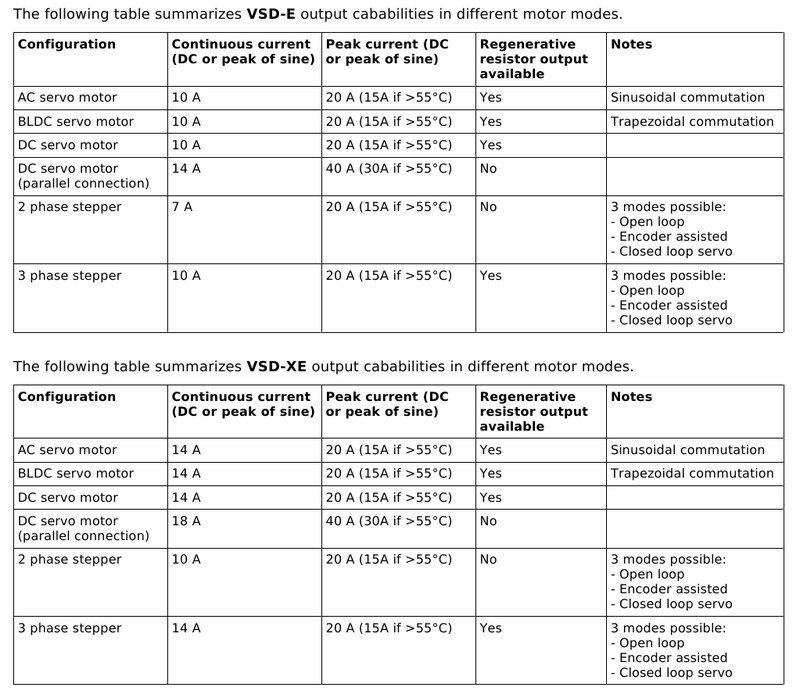 Comparison of the VSD-E and VSD-XE output current limits. 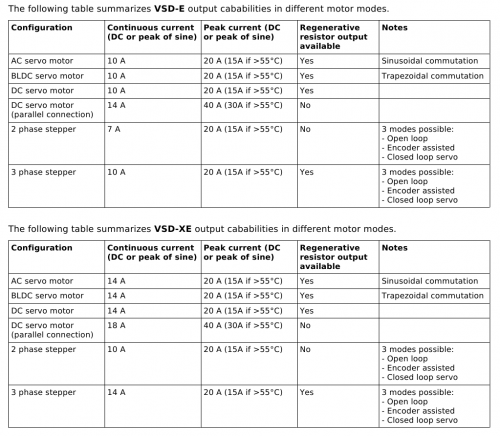 With the new firmware, VSD-E gets the same ratings as VSD-XE. Today we made a new firmware version V210 publicly available for VSD-E-160 drive that increases VSD-E’s output current limits to match VSD-XE ratings. We hope this helps people driving large motors with VSD-E.